Walking into the SRC at 6 p.m., the first thing noticeable was the long line of students that starts at the basketball courts in the SRC North and goes up the hill excited for ASPB’s Skate Night. Over 800 students waited with anticipation Wednesday, Jan. 23 for a night of roller skating, donuts and pizza. The SRC North had been decorated with colorful lights that were flashing all night long. A giant roller skate made of balloons in the corner of the room provided attendees with a great photo opportunity. Set up in the middle of the converted basketball court was a medium-sized roller skating rink surrounded by benches and adjacent to a DJ stage. Eventually, this stage was filled with color and sound, as Top 40 hits blasted from the speakers and moving lights gave the atmosphere a vibrant feel. 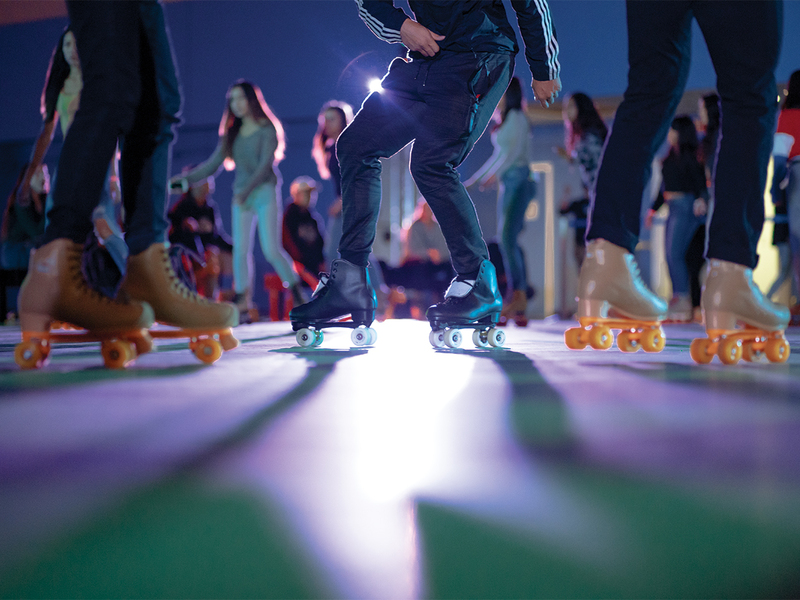 After initial hesitation and awkwardness, the rink soon became a lively mix of skaters, new and experienced alike, gliding around and enjoying themselves. As the more seasoned skaters made their way around the rink in a large circle, groups of friends would hold on to each other as they pushed their feet forward and found their balance. The enthusiasm and atmosphere were infectious, as more and more attendees found their rhythm and joined the flow of students circling the rink. Skate Night’s strength as a bonding activity was most evident in the support everyone showed each other. As less experienced skaters tried to find their balance, others sitting on the benches would extend their arms to offer a helping hand; everyone silently agreed that roller skating was more difficult than they thought. Attendees not interested in skating could also enjoy the photobooth or shirt making activities outside of the rink. ASPB also offered free donuts or pizza. The donuts were great and made for a delicious post-skating treat, while the pizza was filling and provided students with a chance to take a break from skating and socialize with friends. Despite the light, sound and creative activities, the medium-sized rink would prove to be a bit of a problem. Many students who wanted to roller skate found themselves waiting in line to borrow from a limited pool of skates. Since there were only certain skate sizes available, roller skates under size 8 would often run out. Once checked out, students only had around 45 minutes with the skates before returning them – a long time, to be sure, but not enough for some. Pretty quickly, the line for roller skates filled up the room until it was moved to stretch outside of the gym. The rink also felt cramped with the amount of people inside. ”It looks more like a high school dance than a college event,” said second-year pre-business major Keng Phi who was disappointed with the size of the rink and having to choose between the food items. In addition, the rink lacked a railing around the sides, something that is standard at many professional skating locations. Newer skaters, despite the help from their peers, often found themselves confined to the surrounding benches due to the fact that there was no railing to hold on to and maintain their balance with. Despite these complications, the Skate Night was an overall success. The time waiting in line to roller skate did not matter anymore after the exhilarating experience. Laughter filled the area as couples and friends tried to keep themselves on their feet. Those with more skating time under their belt zipped around effortlessly to the music, as the colorful lighting illuminated the room. Skate Night was something new and different that brought in people excited to challenge themselves and have a fun night with friends. 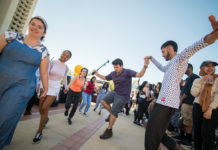 The planning behind Skate Night originated when ASPB’s Concerts and Special Events divisions noticed that there had not been any type of roller skating event at UCR. ASPB decided to test out the event as a bonding experience with fun activities, food and a memorable atmosphere; the result was a large and enthusiastic turnout. 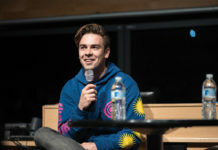 ASPB is planning to improve on this year’s event with revamped music, activities and an improved skating rink. By building on this success, ASPB hopes to continue offering the student body an enjoyable and relaxing experience.